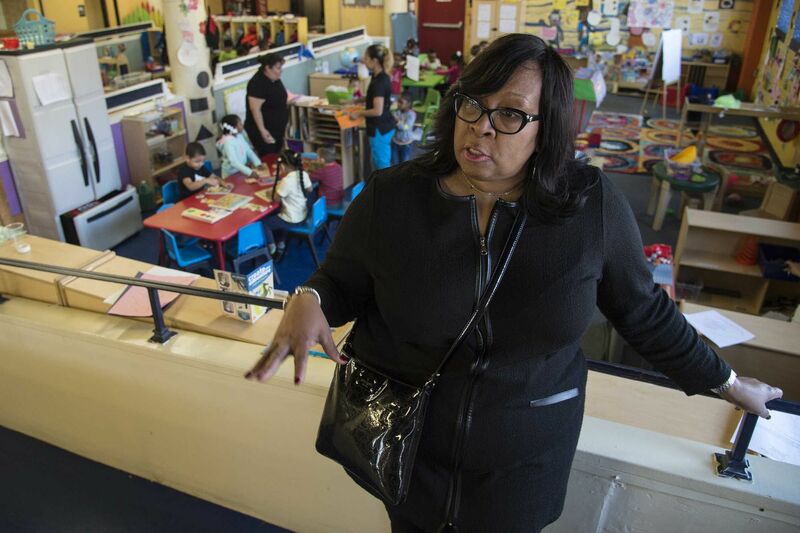 Lisa Smith, 52, owner and CFO of Amazing Kidz Academy, a pre-K provider in the city's expanded pre-K program, talks about the expansion and training to grow her business. Outside of Amazing Kidz Academy on Erie Avenue, Coca-Cola trucks went by, going to and from the bottling plant across the street. Inside the pre-K center, 3- and 4-year-olds played in a newly set up classroom, funded through a tax paid by their neighbors. Amazing Kidz doubled the number of children it served in January thanks to the controversial 1.5-cent-per-ounce sweetened-beverage tax, which is funding expansion of early-childhood education in Philadelphia. The city's drive to improve pre-K opportunities started the same week the tax went into effect. The debate over the tax continues to rage, with Pepsi having announced planned layoffs and retailers steep losses as a result of the levy. Mayor Kenney, meanwhile, points to the children the tax is helping. Amazing Kidz Academy is one of 88 child-care providers that benefited from the tax, adding, almost overnight, staff, space, and in some cases opportunities for the kids and parents they serve. Despite a slow start, the program is now up to nearly 1,800 children added to pre-K rolls citywide. "When parents heard we had openings, it was like a breath of fresh air, they came soaring in, they came in numbers," Lisa Smith, CFO of Amazing Kidz Academy, said on a Monday morning tour of the center. "I've never seen energy like that." Smith started the center, which has a second location in Cheltenham, in 2014. In January, it went from 42 to 97 seats and hired six people across two locations. Smith said most of the families she serves are living at or below the poverty line. "In the bigger inner cities, children start behind," said Smith, a former computer teacher. "They're in kindergarten and they may not be able to write the first letter of their name, recognize numbers, even if they have Grandma hugging and kissing them. ... They can't recoup that lost time." Philadelphia anticipates that it will bring in $46 million in beverage-tax revenue in 2017. Of that, the city will spend $13 million on pre-K this year and reserve $12 million, intentionally untapped while the tax is under appeal, for future expansion. Managing that money is something the city wants to ensure is done properly. "We're very vigilant about staying on top of the providers and making sure ... they are spending the money the way they are supposed to," said Mary Strasser, acting director of PHL Pre-K, the city's program. The city has partnered with organizations to connect providers with financial literacy training, workforce development, and scholarship opportunities for teachers. The centers are monitored and must adhere to contract requirements. Teachers in the notoriously poorly paying industry are seeing modest increases in wages. Clarence Morris, CEO of Amazing Kidz, started giving employees full health benefits, a rarity in an industry that operates on slim margins. Gloria Lee was a week into her job as program director at Amazing Kidz. Lee, a former nurse, whose son attends Amazing Academy, is engaged to be married in six weeks and said the full-time job with benefits couldn't have come at a better time. Lee makes $34,000 a year. In total, the city's pre-K program has added 251 jobs -- some part time, some full, averaging about $14.72 an hour. The program fills a void for parents who are unemployed but who don't qualify for a child-care subsidy, said Stacy Phillips, owner of Pee Wee Prep in West Philadelphia. "I've seen this bridge the gap for parents who are between jobs or a job and school and who can't afford $210 a week for child care," Phillips said. With an influx of beverage-tax funds, the center has grown from 140 to 210 students. Phillips has also hired 10 additional staff members. Phillips started Pee Wee Prep 26 years ago after a traumatizing experience when she left her 6-month-old twins at a neighbor's home day-care center. She came back early one day and found them unattended. The city has no shortage of pre-K centers. High-quality centers -- geared specifically toward preparing students for kindergarten -- are harder to come by. They are typically divided into small group areas for learning through play. At Amazing Kidz last week, one group used stamps to learn letters. A second worked to build a structure out of interconnected blocks, and a third reviewed prepositions with a set of pictures. To grow the program to 6,500 kids by 2021, the city will need to partner with existing high-quality centers such as Pee Wee and those provisional centers on their way, such as Amazing Kidz. "Parents can tell the difference as soon as they get their child in the car because they're finding out what their child learned or he'll start singing the song we taught him," Smith said. At Amazing Kidz last week, Reggie Jackson, 65, a retired special-education teacher, supervised a group of kids from a miniature chair he perched on beside them. He has been an education advocate for 40 years, though he's an admitted beverage-tax skeptic. "Initially, and I'm being honest, I was against the soda tax. But hopefully everything will work out and the funding will be appropriated properly," Jackson said. He paused to mediate a spat between two little boys over some crayons. "I believe we all have a responsibility. We have to prepare them to deal with all kinds of different people, teach them sharing, communicating, conflict resolution," he said gesturing toward the little boys around the table, "and it all starts right here."